VIZ Media Announces "Dead Dead Demon’s Dededede Destruction"
August 31st – also known as 8/31 – is the day an alien mother ship arrived on Earth and parked itself above Tokyo. Now, after three years, the impending doom of an alien invasion is starting to feel like an ordinary thing. Kadode Koyama and her friends, including her best friend, Ontan “Oran” Nakagawa, track the aliens' movement with enthusiasm and begin college. Dead Dead Demon's Dededede Destruction, Vol. 4 (Chapters 25 to 32) opens by introducing two new characters. Futaba Takemoto is leaving a small town in Japan to attend college in Tokyo, to the dismay of her father. She discovers that her classmate, the weird boy Makoto, is a cross-dresser. Before long, Futaba and Makoto will join Kadode, Oran, Rin, and Ai in Tokyo to form a new sextet. Meanwhile, the Japanese government is becoming ever more aggressive towards the alien mother ship, but there is more to the alien “invaders” that anyone knows. For instance, these diminutive visitors (who wear diving helmet-like headdresses) are themselves concerned about the violence of the humans. THE LOWDOWN: As I always write, the Dead Dead Demon's Dededede Destruction manga is a bit odd, as are most manga by Inio Asano. However, Asano's manga are always inventive and often mercurial, with the drama being as poignant as it is offbeat. 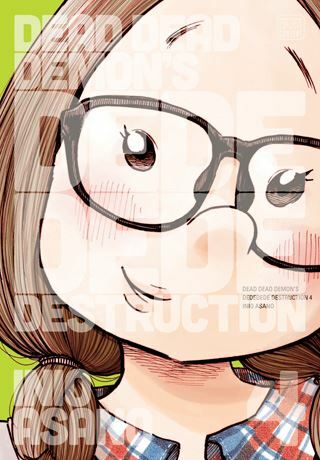 I READS YOU RECOMMENDS: Fans of the manga of Inio Asano will want to read the VIZ Signature title, Dead Dead Demon's Dededede Destruction.